Two 24-bit 192kHz capable Wolfson DACs, Burr-Brown opamps in ouput stage. detail clarity definition in separate instruments, a pleasure and joy to listen to discover hidden detail from your cd collection. Honeset, smooth, full, fast. Open top. proper mids and bass. I removed the A/C filters which opened up the top more and improved the sound by a solid %5 or more. A simple player that just doesn't have any effect or much of a sound at all, without being lifeless. It reproduces the CD without impartiing anyhthing. Too many............. This one is stupid proof. Just buy it. Value for the dollar paid. Full, rich, yet articulate sound. Conveys the rythym and flow of the music. Text Option??? why.... how much did this feature add to the cost. One can only insist that Sony, whom I believe builds the transport, insisted. Needing a replacement for an aging CD player, which I had been using as a transport with a d/a converter, I went about auditioning one box players with a ceiling of 3K (Canadian) in mind. Having a Linn Integrated I considered a Linn player, but while I liked, the value for the dollar was not there. I also listened to several Rotel products, highly rated by reviewers and very good. However once I listened to the CD82T , I kept going back. I just sounded right. I could use all the descriptors one might read in a review, but the word "right" just seems to fit. The CD72 was great, but the 82 was that much better and certainly worth the extra money, having what I would describe as a warmer, yet detailed sound. For my dollar I found this player to be the absolute point of diminishing returns in that I felt it was twice as good as a 1K player, but only marginally behind players worth 1K more ($3000). I would have to spend a small fortune to get something that would be enough of an upgrade to even consider. The true test was bringing the player home, giving it a while to break in, and then having my wife, who pays no attention to the equipment, only the music, ask in a rather suspicious tone if I had purchased new speakers as well. We have both definitely discovered a whole new library of music with previously hidden detail and nuance. In terms of value this is by far the best component I have. I would recommend this for anyone who wants audiophile equipment on a finite budget (like most of us), although this piece has now given me the bug to upgrade amp and speakers. I presently use a Linn Intek 50 Watt Integrated Amp (next on the upgrade list) and Celestion SL12si speakers. I had been using an older Rotel as a transport with a PS Audio D/A Converter. 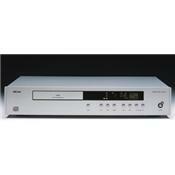 Prior to purchasing the Arcam I auditioned several Rotel players, Linn Genki, Roksan, NAD and Marantz.